In keeping with its new Child & Family Justice Initiative (“CFJI”), the UNM School of Law hosted the first Social Justice Lunchbox of 2019 featuring speakers from the New Mexico Family Advocacy Program (“NMFAP”). The NMFAP serves parents in child welfare cases by providing them with representation in the form of an interdisciplinary team consisting of a court-appointed attorney, a social worker, and a parent mentor. 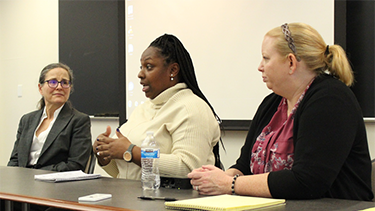 Attorney Leslie Jones, Social Worker Christi Fields, and Parent Mentor Queva Hubbard all shared how they serve alongside one another as a team representing parents involved in Children, Youth & Families Department (“CYFD”) cases. Jones, who has represented parents in CYFD cases for about 25 years, highlighted the need for parent representation. She pointed out how “even though the Supreme Court in Santosky v. Kramer found that parents have a fundamental, protected liberty interest in raising their children that requires due process when their rights are being terminated . . . there are still states around the country that do not provide counsel for parents up until the time of termination of parental rights.” Already, New Mexico’s statutes require parent representation by an attorney. By also providing a social worker and a parent mentor, the NMFAP takes the statutory requirement a step further, thus putting New Mexico ahead of the curve in protecting the rights of parents when compared to other jurisdictions. Jones hopes to see the NMFAP become sustainable and expand throughout the state. Furthermore, she is looking for law students interested in internships with parents’ counsel. Hubbard, in her position as a mentor to parents, seeks to create a space of security for parents experiencing trauma within the system. Having been incarcerated 17 times and overcome a 14 year addiction, she said, “I got a PhD in the streets and a PhD in manipulation. . . . I don’t look like what I’ve been through.” Together with Jones and Fields, Hubbard helps parents advocate for themselves and is successful in doing so because of her firsthand knowledge of what parents go through in the moment. She is able to pick up on cues that others in the team might miss. For more information about the New Mexico Family Advocacy Program, visit https://thirteenthdistrictcourt.nmcourts.gov/overview.aspx. If you would like to learn more about the Child & Family Justice Initiative at the UNM School of Law, contact Sal Guardiola II at guardiola@law.unm.edu or 505-277-9065.